UK passengers on some long-haul flights are set to pay less tax following a revamp of Air Passenger Duty (APD). The two highest of the four APD tax bands are to be scrapped, the chancellor announced. At present it is cheaper to fly to the US than the Caribbean, despite often similar distances, a situation George Osborne called "crazy and unjust". A body representing UK airlines said the move was "a step in the right direction". 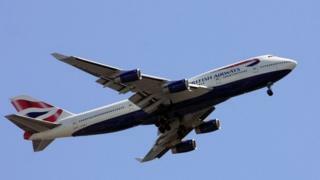 The reforms mean passengers on long-haul flights to destinations such as India and the Caribbean islands will pay a lower tax rate from 2015. Passengers travelling more than 2,000 miles will now pay the band B rate, which varies from £67 to £268, Chancellor George Osborne told parliament in his Budget speech. "From next year, all long-haul flights will carry the same, lower, band B tax rate that you now pay to fly to the United States," said Mr Osborne. APD was criticised for being based on the distance from London to a country's capital city. Thus, the tax on a 4,400-mile flight to Trinidad is taxed at as much as £332, while a trip to Hawaii, 7,000 miles away, attracts a £268 tax because the US capital is closer to London. APD is charged on flights departing from the UK and currently ranges from £13 to almost £400, depending on the distance and the type of ticket. Private jets will now also pay the tax, said the chancellor. Dale Keller, chief executive of the Board of Airline Representatives in the UK, said: "The government has finally acknowledged what the industry and business knew all along - that the highest rates of aviation tax in the world were a brake on driving the UK's economic growth with emerging markets. "Of course we would like the chancellor to go further still on reducing APD but this is a step in the right direction and we will continue its engagement with the government to deliver the fair and proportionate aviation tax that the UK deserves." A Virgin Atlantic spokeswoman said: "A two-band APD rate is a very welcome simplification to remove some of the biggest distortions of the current system." British Airways said the government should go further and abolish APD completely. "The only long-term solution is to scrap APD in its entirety and allow the aviation and tourism industries to flourish, to the benefit of the wider UK economy. APD remains the highest aviation tax levied in the world," a spokeswoman said.